These photos were taken Monday afternoon at Beachwood Blendery in Long Beach, where they held the drawing for their 8th Annual Pliny Fights Cancer Charity Raffle. As you are most likely aware, the beginning of February is when Russian River’s triple IPA, Pliny the Younger is released. 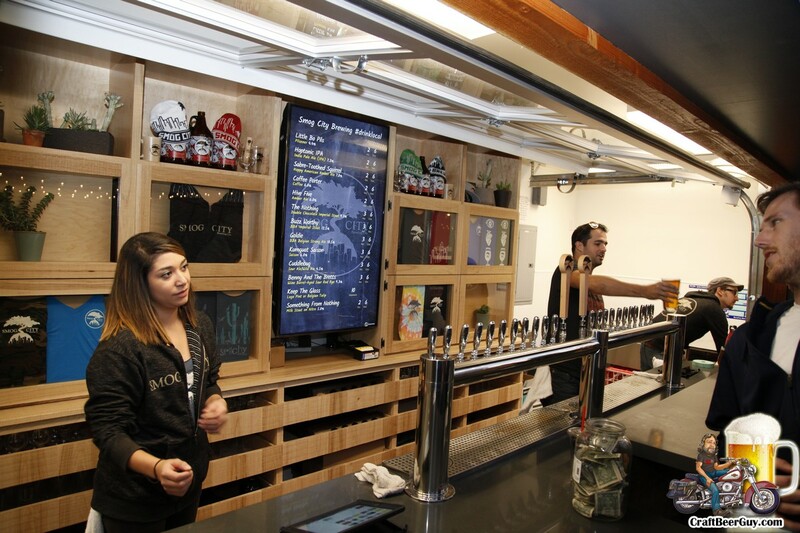 It is highly sought after and usually requires trying to find a place that received a keg from Russian River, then figuring out the day it will be tapped and dealing with the inevitable lines. Beachwood BBQ & Brewing decided to do it a little differently. 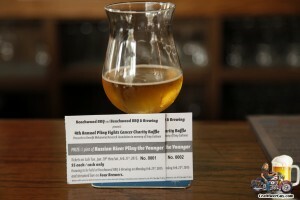 For eight years now they have been selling raffle tickets to get a 16oz pour for $5.00 with the proceeds going to the Melanoma Research Foundation in memory of a long time Beachwood friend, Tony Carbone who passed away in 2008 from Stage 3 Melanoma. These photos were taken Monday afternoon at the Beachwood Blendery in Long Beach, where employees, friends, and family gathered for the drawing of the raffle tickets sold for Beachwood’s 7th Annual Pliny Fights Cancer Charity Raffle which is done in memory of a long time Beachwood friend, Tony Carbone who passed away in 2008 from stage 3 melanoma. 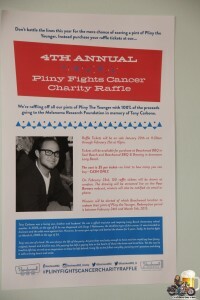 These photos were taken Monday afternoon at the Beachwood Blendery in Long Beach, where employees, friends, and family gathered for the drawing of the raffle tickets sold for Beachwood’s 6th Annual Pliny Fights Cancer Charity Raffle. These photos were taken Monday afternoon at the Beachwood Blendery in Long Beach, where employees and friends gathered for the drawing of the raffle tickets for Beachwood’s 5th Annual Pliny Fights Cancer Charity Raffle. 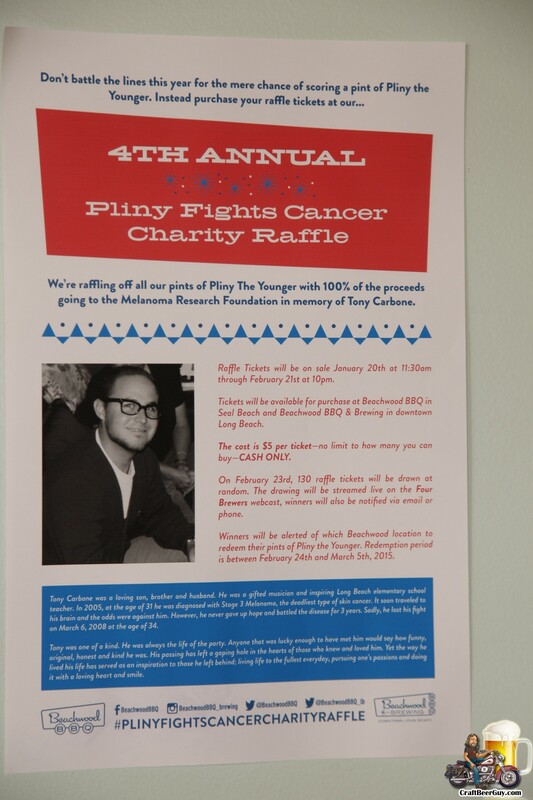 To enter the raffle, you could buy a $5.00 raffle ticket at the Seal Beach or Long Beach location; winners get a pint of Pliny, those that did not win a pint of Pliny at least knew that their donation was going to a good cause, the Melanoma Research Foundation. This year they raised more than $10,000, bringing the total raised over the past five years to over $50,000! This morning, Beachwood BBQ & Brewing held their drawing for the 4th Annual Pliny Fights Cancer Charity Raffle at their Long Beach location. To enter the contest, one merely paid $5.00 for a chance at a full pint of the 2015 Pliny the Younger. This year Beachwood raised about $11,600 from the ticket sales which equates to about $40,000 being donated over the course of four years to the beneficiary of the raffle, the Melanoma Research Foundation. The drawing was streamed live via the Four Brewers podcast and 140 winners were picked; to my surprise, I actually was one of the winners and I rarely ever win raffles. Last month at this time, kids around the world were getting excited for the upcoming Christmas festivities; for craft beer aficionados the excitement builds for the release of Pliny the Younger, the seasonal triple IPA released by Russian River Brewing every February. A couple weeks after that, a few kegs are sent out to select Russian River accounts. One of those accounts is Beachwood BBQ and Beachwood BBQ & Brewing. 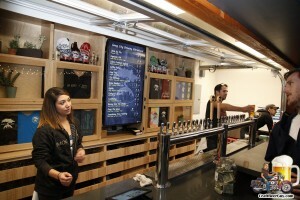 For the past four years Beachwood has been having a charity raffle for chances to win one (or more) of the 130 pints they will have available between their Seal Beach and Long Beach locations. The beneficiary of 100% of the monies raised goes to the Melanoma Research Foundation done in memory of a long time Beachwood friend, Tony Carbone who passed away in 2008 from Stage 3 Melanoma. I bought the first two tickets!